I don’t know about you, but I tend to chop and change beauty products quite a lot, and never stick with them long enough to see the benefits. I read about a “miracle product”, buy it and give up after a week because it hasn’t got rid of my dark circles, wrinkles, or made my skin glow. I have recently found some products that I do really like, so I thought I’d share them in case anyone is looking to change up their skincare routine. I’m still looking for an eye cream that can tackle the mega dark circles of a mama who rarely sleeps through and doesn’t drink enough water, so send your recommendations my way!). This was one of those supermarket grab and try purchases when I desperately needed a new cleanser. I was drawn to the colour, and the rose and jasmine scent, and wanted to try something for sensitive skin as my face tends to get dry in the winter. I should have known that being a creamy cleanser I wouldn’t feel as if it’s really doing a good job of removing my make-up, as I’ve had that problem in the past. The first few times I went through a fair few cotton wool pads before my face felt clean, so now I massage it into my skin and rinse with water first, then use a second lot of cleanser on cotton wool to finish off. It still feels like it needs a refreshing toner after though, or a facial scrub. I love the smell, but I don’t think I’ll be buying this one again. I’d like to try a cleansing oil to see if they cleanse without stripping my skin of moisture like a micellar water tends to. If you have any recommendations, let me know! I LOVE the smell of this face wash. It’s really citrusy and fresh, and perfect to wake you up in the morning. I first bought this four years ago after our eldest son was born and I felt like my skin needed brightening up. For some reason I never replaced it when I ran out, but I recently remembered about it and picked up a tube. I use this every morning (though I think every other day would be enough), and feel like it leaves my skin ready for some serum and makeup. It’s not too gritty or harsh, but still feels like it’s doing a good job of exfoliating. I’ve got quite sensitive skin, and this isn’t too harsh. Earlier this year I was told by a “facial expert” that I needed three lots of fillers to plump up my skin and disguise my wrinkles. I was furious that someone was trying to sell me £300 worth of what was essentially Botox, but at the same time I became quite self conscious about my skin. I started googling anti ageing products, and kept being directed to creams and serums with Hyaluronic Acid (sounds scary!). They tend to be quite expensive, but I found a fairly reasonable one in Boots. I was buying the face scrub above, and moisturiser below anyway, so made the most of a 3 for 2 offer to give the firming serum a go. I actually think it’s working. My skin does feel firmer after a few weeks of using it every day (a tiny amount goes a long way, so it should last), and it makes my face feel velvety soft which is a great base for makeup. I’ll be sticking with this daily until I run out to see what the result is. Can you tell I find a brand I like and buy ALL the products?! Of all the skincare products out there, I find moisturisers the most difficult to buy. There are just so many out there, and you can get sucked into spending loads of money on something that might not work (speaking from experience here as someone who has a £45 jar of greasy face cream I’m never getting to the bottom of). Since I love the orangey smell of the vitamin c+ range, I decided to give the moisturiser a go. Now, I wouldn’t say it’s the perfect moisturiser for me as it is quite thick and doesn’t get totally absorbed so I can’t use it before putting makeup on or my foundation slides off half way through the day. I’ve been applying it at night instead, after the serum, and my skin has been lovely and soft in the morning. I think because it’s not a very pricey moisturiser I’m happy to just slap it on every day without worrying that I’m wasting it, and I might try one of the other moisturisers in the range when I run out. 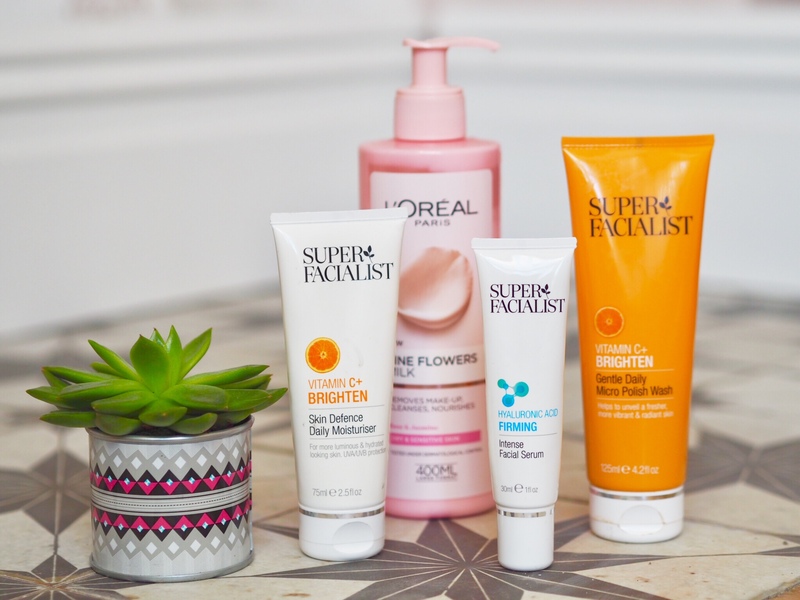 So they’re my four current skincare products … have you tried any of them? And is there an eye cream or cleanser you can recommend?! ← (AD) A Christmas shopping dash at Fforestfach Retail Parc … and what we bought!